Sometimes you find what you’ll need, even though you don’t know how bad you’ll need it. 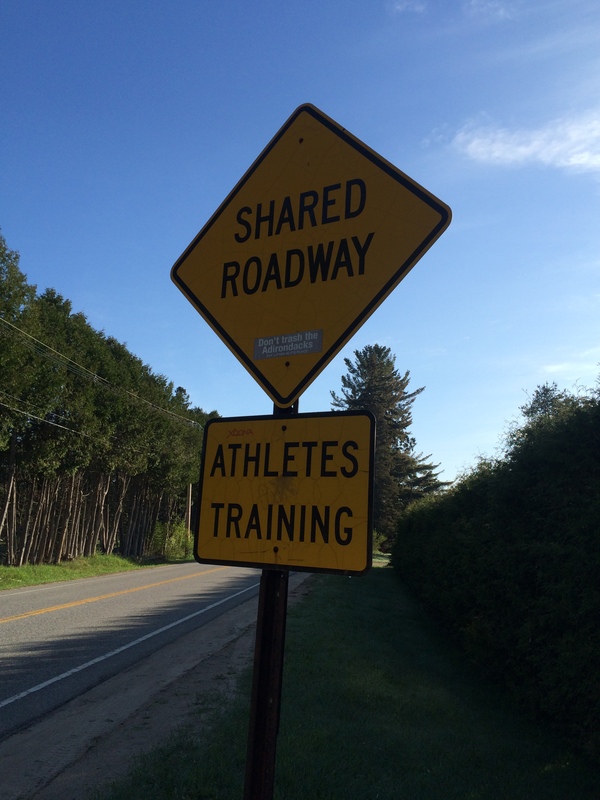 Two weeks ago, my husband, Craig, and I went up to Lake Placid, NY, to preview the Ironman Lake Placid (IMLP) course. We’d been there before, and Craig’s done the race before. But I never imagined I’d actually do this race when we were there before. So, this was my time to see it with different eyes. We drove up on a Saturday and were there through Monday. Having seen the area before, and now having seen it on the Computrainer several times, I started to get butterflies in my stomach when we entered the town of Keene. This race is so monumental to me. I’ve sort of built it up into something bigger than it actually is. Luckily, this trip allowed me to live and breathe it a bit, so I can now imagine myself doing it. 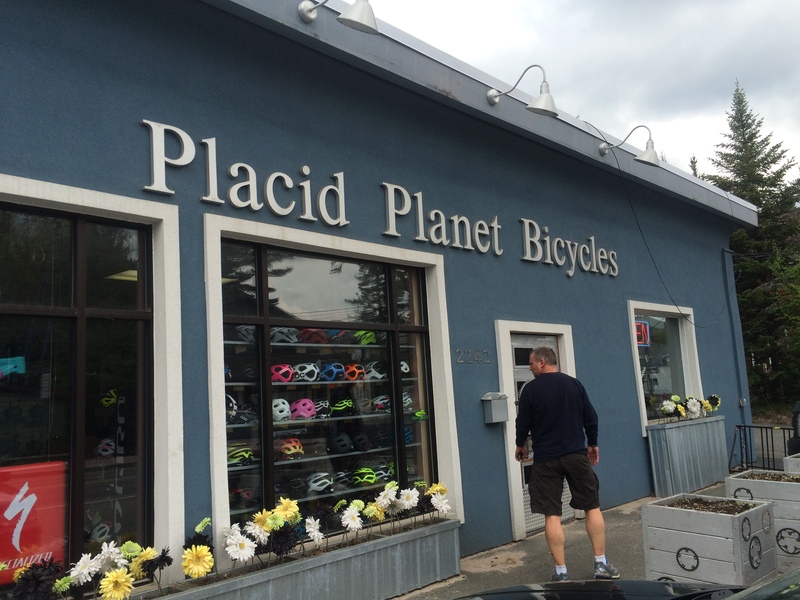 We got checked into our hotel and made a stop at the local bike shop, Placid Planet Bicycles. We also went to the local Price Chopper grocery store and got food supplies for the next couple of days. The weather was perfect. We would ride one loop of the (two-loop) bike course on Sunday, and run one loop of the (two-loop) run course on Monday, then drive home. We didn’t bring our wetsuits for the swim, because we thought it would be too cold. But, remarkably, there were people out there swimming, even in mid-May. Our morning ride started out a little bumpy. I had changed my wheels out before the trip – to take the better gearing off my road bike and put it on my tri bike. So, in a way, I had calmly practiced changing my tires. And I felt pretty good about that. But riding down out of town that morning, I immediately got a flat on my rear tire. (So, out of the two tires, the rear tire is the hard one to change.) Anyway, I started trying to change it, and even though I’d practiced and felt like I knew what I was doing, I got flustered and frustrated. This made Craig frustrated also. I changed the tube out fine, and inflated it with the CO2 cartridge. But then I couldn’t get the wheel back on my bike. Craig finally took over and did it for me in about 10 seconds. This was definitely the low point of the entire trip. But we rolled on. Getting really underway on the bike helped clear our minds, and I resolved to practice changing my tires every day until the race. (It hasn’t been quite that often. But, I have been practicing!!!) Descending into Keene was really the only part I did not like. I’m not a good descender, and I really slow down on the downhills. It’s actually a little embarrassing, but I’d rather go up-hill all day than do a long, winding descent. The other thing was that the road surface was pretty rough in some spots. So, I was already braking for the downhill, and then I wanted to slow down even more for the potholes. Maybe, just maybe, they will be fixed by the time we race in July. The Whiteface Mountain section on the way back to Lake Placid was pretty challenging, but not as bad as I thought it might be. The Computrainer version of the course is an old course, so this part was different from what we’ve been practicing on at home. But one thing that is the same is the “three bears” section. There are three famous hills coming back to town: Baby Bear, Mama Bear, and Papa Bear. Someone has even marked the road, so you know when you’re on each one. I was so glad to get to Papa Bear and find out out it wasn’t ridiculous or impossible. All in all, it was a beautiful ride, and I look forward to doing it in the race. Having said that, doing it twice after a 2.4-mile swim will be a different story. But still, it’s doable. After our ride, we took in the fabulous views of Mirror Lake, where the swim takes place. We ate at the Lake Placid Pub and Brewery, which looks out on the lake. It was so good! And, our waiter is a triathlete who lives in LP year-round. So, it was fun to talk to him and get the scoop on what the town is like from his perspective. He is training for Ironman Wisconsin. So, he and Craig talked about that course, since Craig has done that race also. It really made me think about why I love to run, even though (as you’ll understand in a moment), it’s probably the worse thing I could be doing right now. In the simplest terms, it comes down to this: I love the zone-out. I love exactly what other people hate about running: the boredom. I love that it’s not about what is going on around you, but what is going on in your own head. Everything around you is calm and peaceful and nothingness, giving your mind the chance to go off and figure itself out. I’ve solved nagging work problems and complicated personal problems on so many runs. 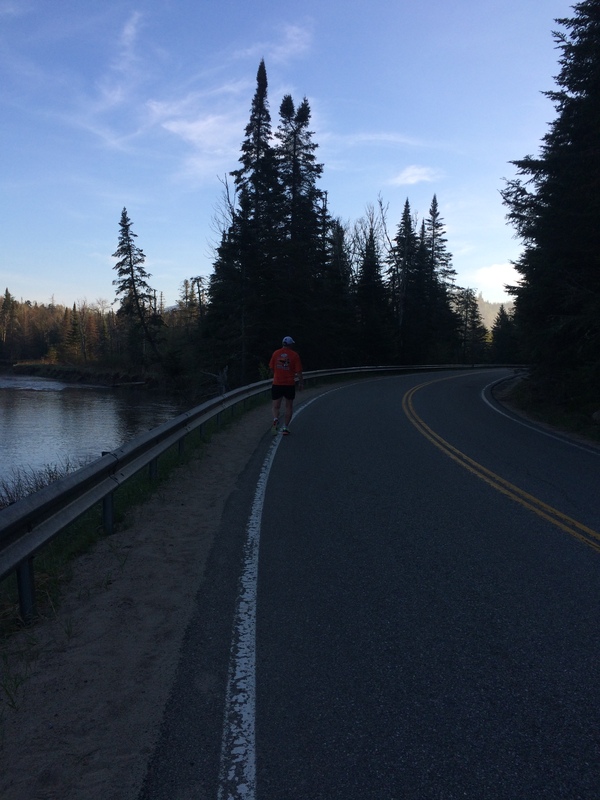 And this experience — of running the Lake Placid run course — helped me come up with my “theme song” for this Ironman. As you may know, when you compete in something like an Ironman, you can’t run with earphones and a music player of any kind. I do a lot of run-training while listening to music (especially while on the treadmill). But I try to do some training without, because I know I won’t be able to listen to music in the race. So, instead, I come up with “theme songs”. These are songs I like to listen to, that get stuck in my head. That way, I can “listen” to them anyway (in my head), while I’m doing the race. I might have one song, or I might have several. But for this race, I’ve chosen the song “Boredom and Joy” by Jets Overhead. 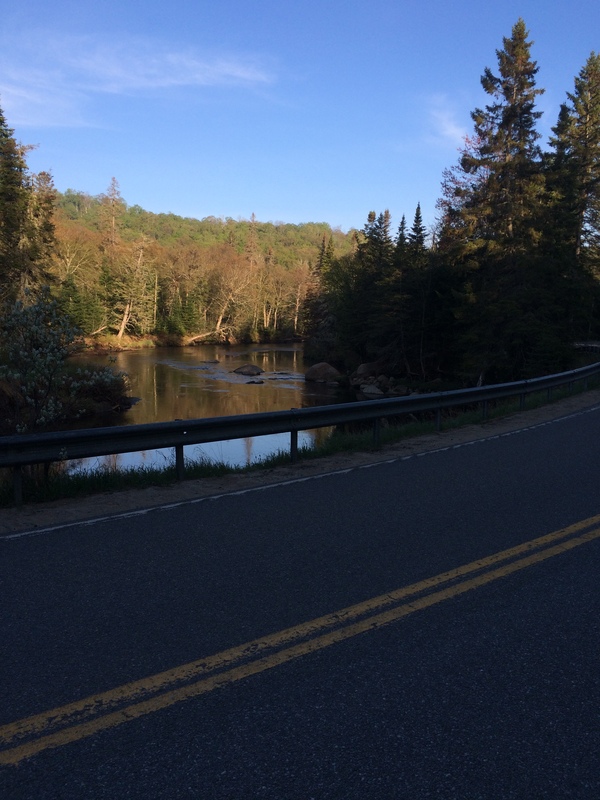 Aside from the fact that I can think about the boredom and joy of running in general, it also has the chorus, “I want to see where the river goes.” And I just think that’s so perfect for the IMLP run course! You’re following this lovely river for a good little while. Why not think of following it until you see where it goes? By the time I do it for the second time, I’ll probably be delirious anyway; so, maybe it won’t bother me that we don’t actually ever get to see where it goes. Now, I have two weeks until my next race (Eagleman 70.3) and eight weeks until IMLP. I plan to swim a lot. 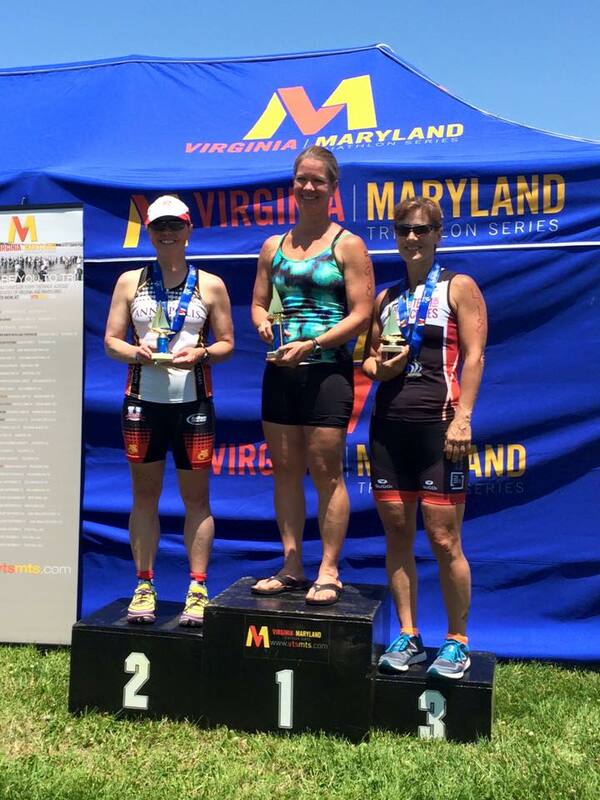 I don’t know if I will run at Eagleman, but I do plan to try and do the swim and bike. Right now, I feel like my injury is such that my hammy can handle it. But I will take it day by day and decide as I go. Ultimately, each decision will be with IMLP in mind. I want to make it to the start line. And, when the day comes, I want to run down that river road and see where it goes. 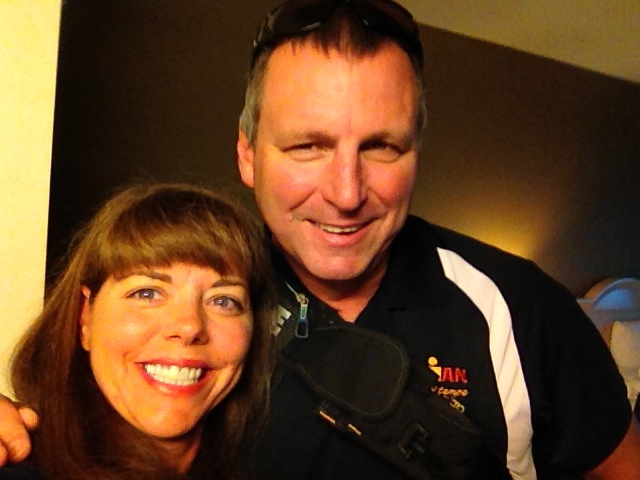 He and I will be training together for two tough Ironman races this year, and I can hardly believe it! However, if I had to pick someone to train with, who can help me get through just about anything, it would be him. He’s the kind of person you’d want to have in your foxhole for sure. So, how and why am I lucky to be married to this man? Well, I really can’t sum it all up in one blog post. But I figured I’d focus on one of the most remarkable traits about my husband… and that is that he can talk to just about anyone. It doesn’t matter who he might encounter on a given day, he will talk to to them… make a joke, take an interest in them, take some time. He’s never too busy or too self-centered to just talk to people. (I am quite the opposite, by the way…) Seriously, in all the places we’ve lived and the things we’ve done together, I only know our various neighbors and many other people we’ve encountered because of Craig. We’ve had fabulous neighbors and remain friends with many of them — only because of him. How lonely and limited my life would be if not for him! And then, there are the people who work at the local market, or the people at our gym, or random people who work in his building that he just happened to strike up a conversation with. It’s really a gift, I believe. And it’s not just a gift that he has. It’s a gift that he gives. He jokes with people; he puts them at ease; he brightens their day. And on top of just talking to people, he remembers stuff about them. We won’t have seen some of these people for months or even years, and yet Craig will remember something about their life or whatever they had going on and he’ll ask about it. It’s so easy to be too busy for other people, but he hardly ever is. And I benefit from all this in many ways. Not only is my life richer through knowing people better. But it also reminds me to try to be more like that… To try to encounter other people and celebrate life with them –even on the smallest level. If you think about it, life is like a dance. We encounter people everyday, and we sort of do a dance with them. We say hello, ask questions, exchange ideas, thoughts, complaints, etc. There is a give and take there, but we don’t always make it a fun exchange, the type you look forward to. I feel like the dance I do with people on a daily basis is sort of like a waltz… very formal, not too exciting, nothing memorable. But I feel like Craig’s dance is more like a disco. It’s fun; it’s humorous; it doesn’t take itself too seriously. You look forward to it, if for no other reason than because it’ll probably make you laugh. I’d like to be more like that. Let’s disco, baby! Today, I took the day off from work to clean my house… Yes, it’s THAT bad… Exactly what are you trying to say? It’s true that my car looks like I live in it, and my house looks like no one could live in it. What the heck?! The sad thing is we aren’t even training for our next Ironman yet. This is definitely NOT ACCEPTABLE. I must rectify this situation!!! My mom would not approve of the clothes on the floor. No way. But, hey, at least the bed is made. Yes, it’s the craziest thing, but even with the look of a recent tornado throughout the rest of my house, I can’t stand to *not* have the bed made. My husband, Craig, has accepted this obsession of mine and dutifully stands by the bed, ready to help me make it every morning — just as soon as we get up. It’s so sweet. But it’s pretty ridiculous when you look at the rest of our house. Why should the bed be different? I guess somewhere along the way, as we got into training for triathlons more and more, I gave myself permission to, um, let’s just say … not always get all my chores done around the house. And, then, eventually, I just didn’t have enough energy to do all that stuff! Honestly, I’ll buy flowers or shrubs to plant in the yard on Friday evening, and that’s as far as they get. They’ll sit there in their plastic pots the rest of the weekend while we’re out training, waiting for me to put them in the ground. “Maybe next weekend,” I’ll think. Poor plants! Or, maybe I’ll actually pick up all the clutter in the house, but I’ll never get as far as sweeping and dusting and really cleaning once I can finally see the floors and the counters and the furniture. It’s about to drive me insane. Cobwebs, and dust bunnies, and dog hair, oh my!!! I’ll get up each morning during the week, sometimes earlier and earlier, thinking I’ll get some of it done before I take the dogs for a walk and go to the gym… I look around and try to get a little done here and there. But, I have this sort of all-or-nothing feeling, like I can’t dive into a cleaning project unless I know I can do it completely. It’s very frustrating. Then, on top of that, I’ve gotten up so early that when I get home from work, I’m so tired, I can’t do anything either. At one point, Craig and I made this plan to do 15 minutes of cleaning every evening, and we haven’t even been able to do that. We are ri-DIC-u-lous! What I think is funny is that we always seem to get the laundry done. I wonder if this is true for a lot of triathletes. 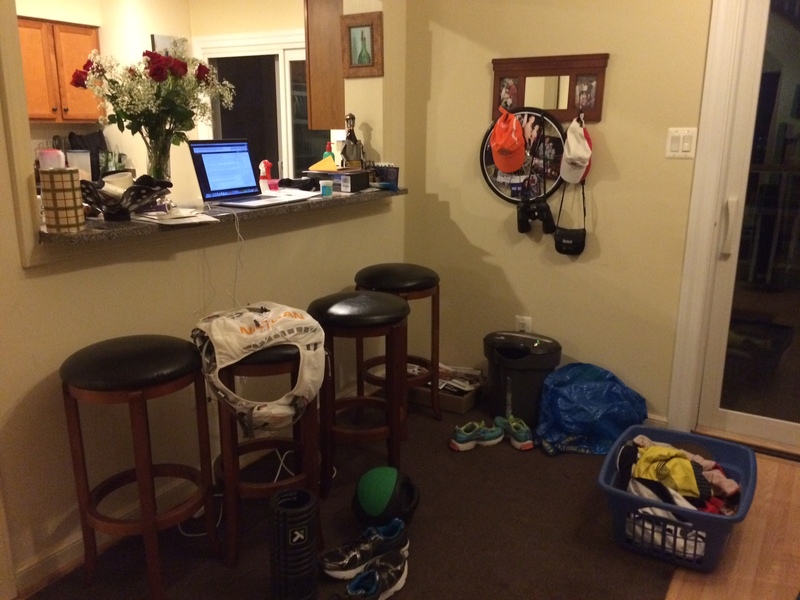 If there are two chores that never take a backseat when you’re training, it’s laundry and grocery shopping. 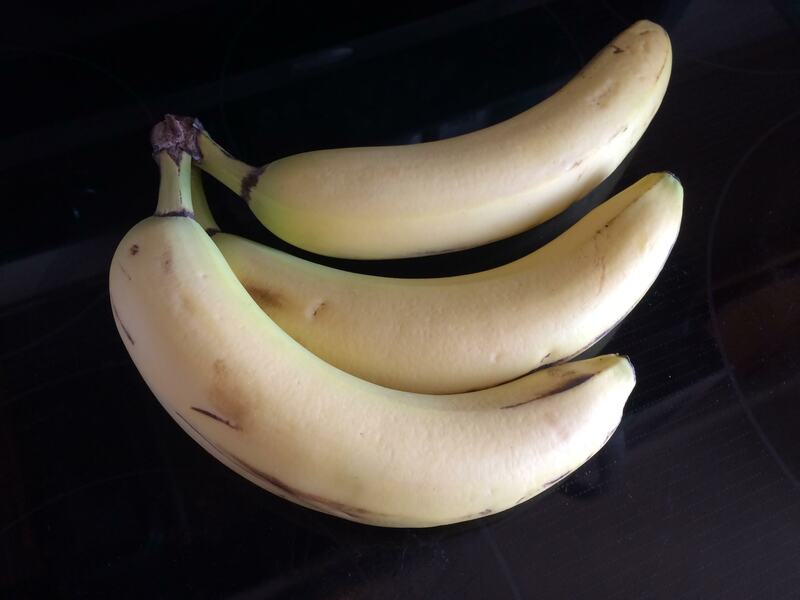 You’ve got to wash those stinky, sweaty workout clothes, and you’ve GOT to eat! Okay, so maybe the laundry does not always get completely put away. But it’s clean. It’s piled up in the laundry baskets… or on the couch… or on the bed. But the laundry is CLEAN, and the bed is MADE, dammit! And, I don’t even need to go to work on a Monday to feel the shame of my triathlon lifestyle … I’ll go to the gym, where other people are spending precious chore-doing time exercising instead of polishing the bannister… And I’ll ask them what they’ve been up to. They actually have the gall to have done something like replace their hardwood floors, or they’ve re-painted their guest room, or they’ve cleaned out their garage… IN ADDITION TO training. How dare they! And, then sometimes, I’ll just walk outside my house and have a conversation with my neighbor about all the amazing stuff she has done inside her house… like dusting all her china or cleaning out her fridge. Mind you, the reason why I have to walk outside my house to have this conversation is because I couldn’t possibly let her come into my house. Not in the state that it’s in! But the truth is, I don’t really have much to say that I think other people would want to read. Let’s face it: there’s a lot of crap out there to read on any given day… With email, and Facebook, and Twitter, and texts, and news, and dare I say actual work-related, school-related, or even book-related reading to do… we must all pace ourselves. If I’m going to throw one more thing onto your reading list, I feel like it should be worth your precious time and attention. Yet, here I am trying to come up with something — so the Internet engine won’t mark my site with demerits for being dormant. On one of my most recent training runs, I was listening to the playlist I’ll post below. 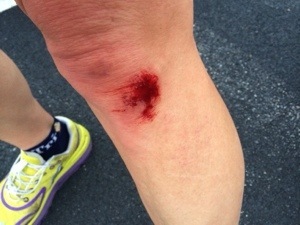 It was also on this run that I twisted my ankle, scraped up my knee (see photo), and smacked my new iPhone flat against the paved trail when I fell. But luckily, my awesome phone case protected it, and it seems perfectly fine. I’m happy to say that my ankle was fine enough for me to keep running, and I am trying to be nice to it now – so it will heal completely. Also during this run, I became preoccupied with stars, due to several songs included in this playlist… We recently went to see one of my favorite bands – Bell X1 – so they featured prominently in the list. “He said they’re like headlights in the rear view mirror – they’re closer than they seem. And from this gutter, we’re still staring at the stars. Another thing I was thinking about during my run was that the Ironman World Championships in Kona, Hawaii, are coming up. I think it was when we went there to see our friend James do that race many years ago, that we watched the stars at night, and I got to see shooting stars and satellites crossing the night sky for the first time. Last year, before Kona, one of my favorite pro triathletes, Linsey Corbin, posted a series of videos about her preparation for Kona. That’s where I heard the song Souls to the Coast by Joyshop. With the ukelele as the main accompaniment, it is such a perfect backdrop for a video showing a bike ride to the Hawaii coast. 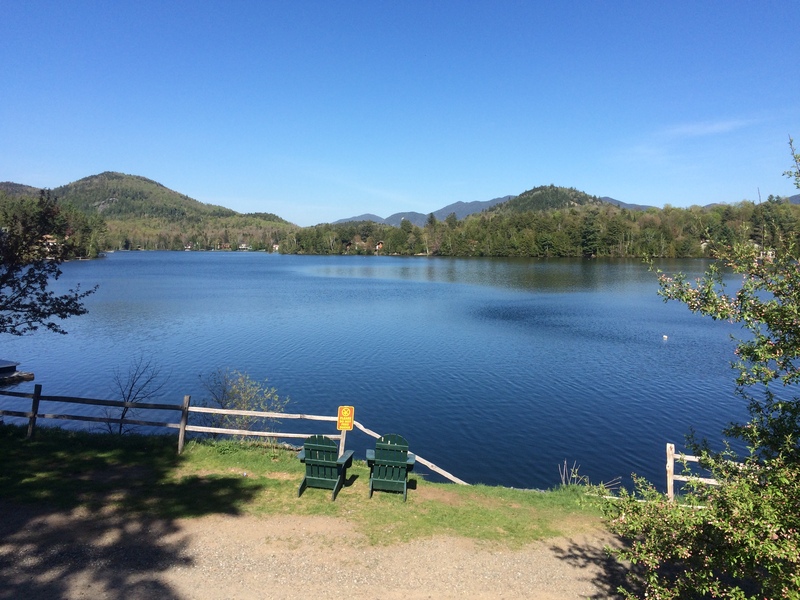 “Lake Placid is going to be totally different from Arizona,” our friend James warned me, adding, “I just want to give you the 911 on that.” I laughed and said it was scary for him to be ‘giving me the 911‘ instead of ‘the 411‘. Indeed, I already knew that Ironman Lake Placid is a lot harder than Ironman Arizona. The bike and run portions are both hilly, and the weather can be rainy and even steamy; but the scenery and overall race experience promise to be spectacular. So, since I already have ‘the 411’ on it, my goal will be to make sure my husband and I won’t need ‘the 911’! We are both signed up to do Ironman Lake Placid in 2015. That means we’re in for some more intense training and, hopefully, an even healthier lifestyle in the year to come. We’ve certainly taken things a lot easier in the year since we did Ironman Arizona together in 2013. And we could both stand to get even more firmly back on the healthy eating bandwagon. It’s going to be another wild ride! In the meantime, I am wrapping up my first season coaching for Team in Training, which is a program that helps people train for endurance events while they raise money for the Leukemia & Lymphoma Society. The people I am coaching are amazing! They are driven; they set goals; they care about other people; they care about each other; and they know how to go the distance. They remind me every week that while we preoccupy ourselves with the challenge to go another mile; other people are battling for their lives. So, to just do an event is not enough. Let’s also raise awareness, raise funds, raise up these patients and their families. Let’s raise the bar. We can’t cure the diseases, but we can do something. And so we do. My father is a cancer survivor. He didn’t have a blood cancer; he had colon cancer. But I still feel like helping LLS is helping people like him, because blood cancer research has led to treatments that can be used against other forms of cancer. I was able to help my stepfather by giving him a kidney. But I couldn’t give my dad a colon. That would have been so cool if I could have! Still, I think about him and how he has gone on to live fully despite what cancer took from him. He is an inspiration to me! I’m keenly aware that things don’t go so well for all cancer patients. One of the Lymphoma patients that we consider an honored teammate with Team in Training just started a new chemo regimen in her five-year battle against cancer. It will mean the fifth time she will lose her hair. And yet, she faces it with grace. The other day, she posted a picture of herself while she was getting a treatment, and her beautiful smile told you that her spirit is still strong even if her body is tired. She is also an inspiration to me! 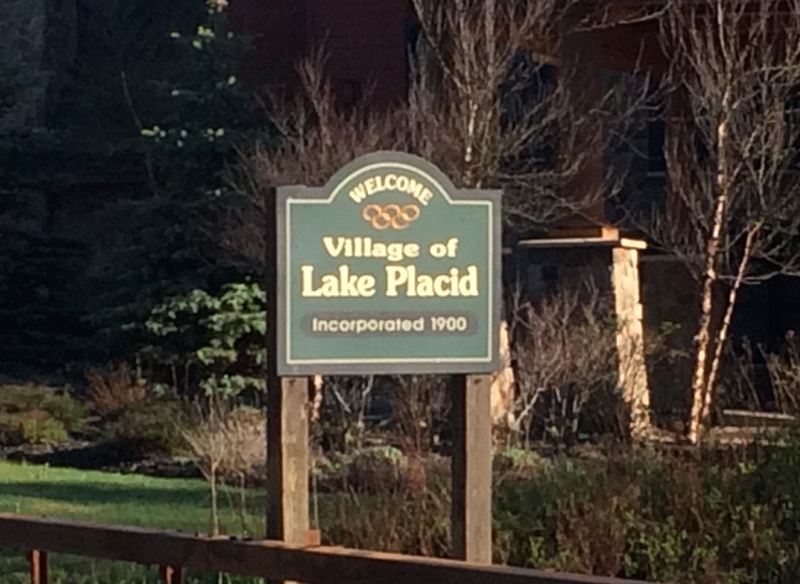 How does Lake Placid compare to losing your hair and parts of your body to cancer? I think that’s all the 411 I need to keep me going!